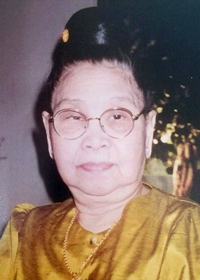 Hom Ha Thi passed away in Des Moines, Iowa on Saturday, June 9, 2018 at 4:44 PM surrounded by her loved ones. She was 86 years, 2 months and 13 days old. The daughter of Son Lu Van and Eng Lu Thi, Hom was born on March 27, 1932 in Ban Bo Muong La, Son La. She was the youngest of five children. During the First Indochina War, Hom’s family moved to Hanoi for nine months then resided in Xiang Khouang. On July 21, 1954, Hom relocated to Ban Som Puoi in Vientiane, Laos with her son Khan, mother Eng, brothers San and Houan and sister-in-law Ing. In 1956, Hom met the love of her life, Suy Ha Dinh, got married and moved to Ban Sykhay. In 1963, they moved to Ban Nong Boua Thong where they raised nine children. In 1974, the family of 11 escaped Ban Nong Boua Thong to Thailand and arrived in the United States in November of 1975. Hom’s family was sponsored by Ruth Van Note, Pastor Frederick and Carol Kramer with the help of St. Stephen’s Episcopal Church in Newton, Iowa where she worked at the Best Western Inn. After four years in Newton, Hom and family settled in Des Moines, Iowa where she was employed at Parr Manufactory. Opposite of her husband, Hom is known for being very outspoken. She had the ability to bring joy and happiness into each person’s life she came across. Her hobbies included cooking, gardening, sewing and gambling. She enjoyed going to the casino, fixing any broken item with duct tape and spending her time with her large family. Hom is survived by her son, Khan (Sanith) Lovong; eight daughters, Fo (Jean Guy) Casenaz, Phong (Khoun) Lovan, Yong (SengNgeun) Lovan, Vong (Nam) Nguyen, Sone Ha Thi, Mone Ha Thi, Pody (Peter) Sayasit, Lachoy (Edward) Thompson; 24 grandchildren; 17 great grandchildren; many relatives and several friends. She is preceded in death by her parents, two brothers and two sisters. Funeral service will be held at Hamilton’s near Highland Memory Gardens, 121 NW 60th Avenue, Des Moines at 5:00 p.m. on Thursday, June 14, 2018. Memorial contributions may be directed to the family in her loving memory.